We can't give you a quote from Artur M46 Transport, but we have hundreds of drivers waiting to offer you a great price. Have a question for Artur M46 Transport? No problem, send them a message and they'll email you back as soon as possible. If you have a more general question you might find it answered in the FAQ, or you always contact one of our brilliant customer service team. * Artur M46 Transport won't be able to see your email address. We are experienced couriers with friendly staff and low prices. 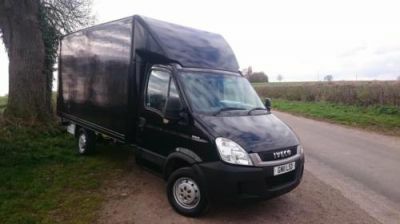 We have long wheel base Iveco Luton vans with Tail lift. We use blankets, foams, and other transport aids, and straps for customer’s goods to make sure everything is safe and secure and goods are not damaged or scratched in any way so the move is customer stress free. Very experienced with motorbikes, antiques, fragile goods (including pianos). Extra mile service guaranteed. Fully insured with hire and reward & goods in transit insurance. . If 2 men required please state before accepting bid as this is not standard on the van, otherwise help will be needed at collection and delivery with large or heavy items. If you would like to travel in the van please confirm it by a text message or email as sometimes there is two men team and sometimes may dogs travel with a driver! Thanks for considering our quote! Very pleased with the service received, both driver and assistant took Lenten care of my furniture and nothing was too much trouble - would 100% recommend. Great driver and helper. They arrived on time and worked very hard to move a large amount of furniture, much of it heavy, and boxes. They drove the load over 100 miles. They were also really nice guys. Would I recommend them? Absolutely! Outstanding - the price I paid was fairly low so my expectations were not particularly high..however the service provided was exemplary! I thought I'd paid only half at booking, so paid the other half in cash to the driver. Now the full amount has been taken out of my bank account, so I've overpaid by £50. This does not make me happy. We are surprised that there was confusion with this as you have to select that you wish to pay either the full amount or deposit only when booking online. In addition, the amount you have paid and whether you have paid in full or the deposit only is very clearly shown on the booking confirmation you receive. We trust you have now contacted the driver directly to resolve the issue of the additional payment you made to him. Artur was a star, he did an awesome job...boy can that guy pack a van ... nothing was too much trouble. I would recommend him without hesitation. Very helpful and friendly, looked after our stuff well and helped us unload even when he didn't have to! Great guy! I was very pleased with the service i would recommend this to friends and family thank you. Yes they was late but due to another person not stating the items that wanted to be moved and they went above and beyond to help me out . Although the driver was later then original time, he was brilliant and got everything done for us. Especially on a hot day!! Thanks Arthur. I couldn't recommend any more. The driver was late, but only because most of the major roads locally had been closed for an event. Fantastic service, with a smile, for a very reasonable price. Driver was very helpful and flexible, agreeing to an additional stop. The driver was very professional and punctual. He went above and beyond his responsibilities on the day of my move and offered extra help even though he didn't have to. This was all in all a very positive experience.